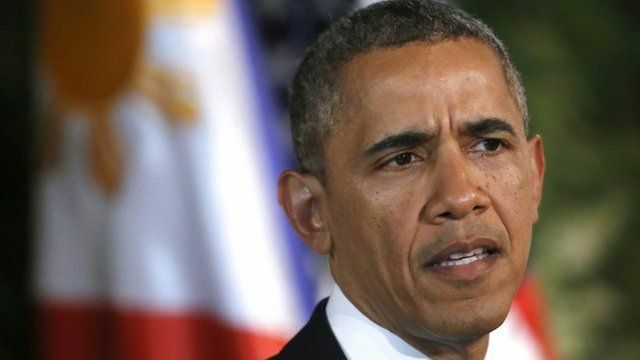 US to expand Russia sanctions Jump to media player US President Barack Obama says the US will step up sanctions against Russian individuals and companies as part of a "calibrated effort" to change the country's behaviour in Ukraine. Military observer freed in Ukraine Jump to media player Pro-Russian gunmen in eastern Ukraine show seized European military observers to the media, as attempts continue to secure their immediate release. 'Real fear there will be a clash' Jump to media player Tension remains high in eastern Ukraine with fears that a Russian invasion is inevitable, reports Natalia Antelava from Donetsk. Sloviansk resident 'feels oppressed' Jump to media player The BBC's Natalia Antelava speaks to people in the town of Sloviansk, in eastern Ukraine, which is under full control of pro-Russian militants. Obama: Putin has a choice to make Jump to media player US President Barack Obama has warned Russian President Vladimir Putin that further action in Ukraine would result in escalating sanctions. Russian military take over Crimea Jump to media player Russian forces have seized all the Ukrainian military bases in Crimea, giving soldiers the choice of leaving the country or pledging allegiance to Russia. Russia sanction retaliation 'on hold' Jump to media player The BBC's Richard Galpin in Moscow said Russia is still considering how to retaliate to the sanctions that have been imposed by the EU after the annexation of Crimea. US President Barack Obama says the US will step up sanctions against Russian individuals and companies as part of a "calibrated effort" to change the country's behaviour in Ukraine. During a visit to the Philippines, Mr Obama said the measures were in response to Moscow's failure to uphold an international accord aimed at peacefully resolving the Ukraine crisis.